You immediately receive Six Weeks of FREE Time, just for downloading. The download is FREE and anonymous. There is no obligation to purchase. After Six Weeks, you can decide if you want to purchase more time. The cost for more time is $50.00 for Six Months, which you can purchase from inside the program. 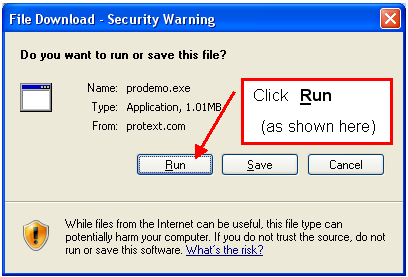 2 - Press the "Run" or "Save File" button, (depending on your web browser). 3 - If asked "Do you want to install and run prodemo.exe"? - press "Yes". 4 - Accept all of the Install Defaults by Pressing the "OK" button several times. After you have dragged the Icons out of the box, you can close the box. NOTE: If you don't drag the Icons out of the box, they will disappear when Windows Restarts! 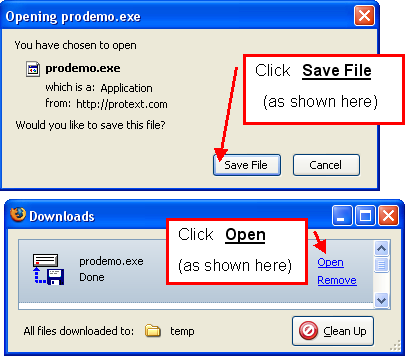 1 - Double Click the ProTEXT Icon. 2 - Use "File" then "Open" to load in one of your ASCII TEXT transcripts. 3 - Use "File" then "Print" to print your reduced transcript. You can view the ProTEXT and ProDEX Mini-Manual here.